Photograph of an interior view of the Chief Queen’s apartments in the Nandaw (Royal Palace) at Mandalay in Burma (Myanmar), from the Archaeological Survey of India Collections: Burma Circle, 1903-07. The photograph was taken by an unknown photographer in 1905 under the direction of Taw Sein Ko, the Superintendent of the Archaeological Survey of Burma at the time. The Royal Palace stood at the centre of the walled city of Mandalay, founded in 1857 and Burma’s last great royal capital. It was one of the first buildings to be constructed, re-using many parts of the teak buildings from the former capital Amarapura. 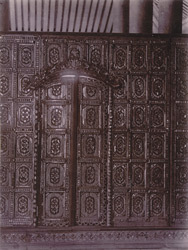 This is a view of a panelled wall and doorway decorated with mirrored glass mosaic in the wooden pavilions occupied by the Chief Queen of the Burmese monarchy. Apartments in the palace were richly decorated with gilding, ornate wood carving and glittering inlaid mosaic appropriate to the requirements of royal magnificance and splendour. The Chief Queen's apartments were situated in the heart of the palace next to the Glass Palace, occupied by the King, in the middle of a sequence of state rooms. These led from the Great Hall of Audience on the east face of the palace, facing the main city gate of Mandalay, towards the more private women’s apartments occupied by queens of various rank at the western end. This arrangement followed the Burmese tradition of building palaces on an east-west axis. The last queen to occupy them was Supayalat, royal consort of Thibaw (reigned 1878-1885) the last king of Burma. They were exiled to India when Thibaw formally surrendered to the British in 1885 following the Third Burmese War, which culminated in the annexation of Upper Burma. The original palace was destroyed by fire during Allied bombing raids in 1945 during the Second World War but has since been partially reconstructed.